CRISPR (Clustered Regularly Interspaced Short Palindromic Repeats) is a bacterial immune system system that has been modified for genome editing. It has two primary components. The first, guide RNA (gRNA), is a short synthetic RNA that consists of a targeting sequence, an easily modified ~20 nucleotide sequence that identifies the genomic target; and a scaffold sequence, which facilitates binding of the gRNA to the other primary component: Cas9. 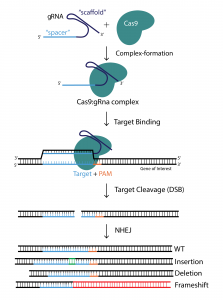 Cas9 is a non-specific CRISPR-associated endonuclease. This enzyme binds to the targeted genome sequence and, depending on your project goals, can perform gene knockout, activation, or repression. A step-by-step diagram of the CRISPR/Cas9 mechanism. gRNA and Cas9 first form a riboprotein complex. When this occurs, Cas9 undergoes a conformational change which allows binding to DNA. After this complex binds to a DNA, Cas9 undergoes another conformational change that positions puts its nuclease domains (RuvC and HNH) to cleave opposite strands. The complex will search for the sequence that is complementary to the gRNA’s targeting sequence. One caveat of CRISPR is that the gRNA’s targeting sequence must be unique and also upstream of a Protospacer Adjacent Motif (PAM). If a match is found, the target DNA is annealed from 3′ to 5′, with RuvC and HNH working on the strand opposite of the complex. The resulting double strand break is then repaired via the efficient but inaccurate Non-Homologous End Joining pathway or the inefficient but accurate Homology Directed Repair pathway. The end result is permanent knockout. Perhaps one of the most remarkable features of Cas9 is that its ability to bind to DNA is independent from its ability to cleave. Because of this, point mutations can render nuclease domains inactive, creating a dead Cas9 (dCas9) without the capability to cleave. dCas9 can be tagged with repressive or activating effectors to modulate expression of the targeted gene. The most commonly used CRISPR endonuclease is Streptococcus pyogenes Cas9 (spCas9). It is relatively large, with ~4 kilobase coding sequence, which allows for slightly more targeting specificity. However, it may not be the best choice for some projects. Its PAM sequence (NGG) is very common in the human genome, and therefore may not result in ideal positioning. Its large size also makes it impossible to package into adeno-associated viruses (AAVs). To solve the AAV packaging problem, there is Staphylococcus aureus Cas9 (saCas9). This endonuclease is ~1 kilobase shorter than spCas9, which makes it ideal for any project that aims to use an AAV delivery system. Additionally, its PAM sequence is NNGRRT, which eliminates the problem of spCas9’s PAM sequence.